Many offices and workplaces have emergency procedures in place for accidents and hazards but not every employee is aware of these instructions. 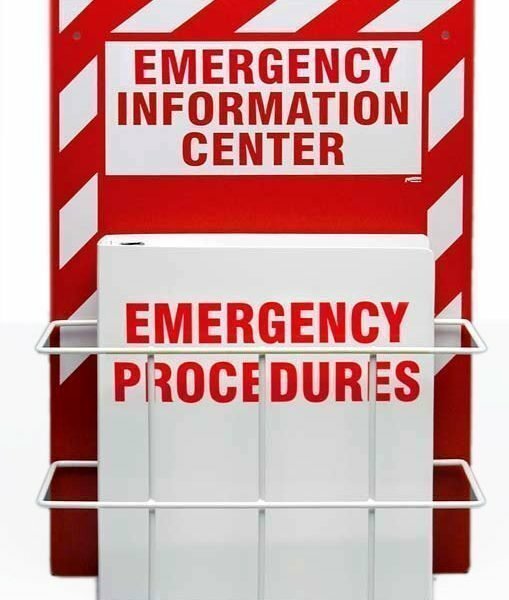 Providing your staff with clearly marked emergency information centers that have detailed procedures for many emergency situations will help everyone stay safe when an accident or natural disaster occurs. At 1st Aid Supplies we offer material safety data sheets, wall mounted racks for emergency procedure cards and high visibility binders to store MSDS information. Not only will emergency information make your environment safer but will also keep you up to code with the latest OSHA requirements.